The start of the year was very scary and emotional for me as my Dad had to go into hospital for an operation. However he went through a lot of pain and it was very scary. I would wake up in the morning hearing him being sick or yelling out in pain and it was absolutely dreadful. I've never experienced that with any family member and my and my Dad are extremely close and it really frightened me, however he managed to recover and get better and now all is well. That was a really scary time. I also went a month with having a really bad back pain and could hardly move. So with that going on, being unemployed and arguing with parents things just didn't seem to be looking up at all and it may sound like such small things to those of you reading this but it was an incredibly stressful few months. This went on from about February to May time. A lot of stress. However it wasn't all that bad. At the beginning of May, my Grandma came over from Mauritius which was lovely. We don't get to see her that often as she lives in Mauritius and it's just exactly a place you can go to for a weekend visit. So it was lovely to have someone else here, especially as my Dad was recovering from his operation. It just made things a lot easier and a lot less stressful. We got to spend a lot of time with her which was so lovely and I managed to celebrate my 24th birthday with her as well which is something I don't get to do at all. I think the last birthday I celebrated when my Grandma was here was my 16th or 17th! Quite a long time ago now but we loved having her here and I'm super excited to see her when I go to Mauritius again next year. One of my highlights of 2015 was managing to find my first proper job. After years of working at a tutor center and doing countless work experience jobs here and there I applied for a job with British Airways and managed to get the job. I completed four weeks of extremely intense training. Not going to lie here, tears were involved and I was so nervous that I wouldn't get through. I did though in the end and I was so super happy and proud of myself. Ever since I was younger I have loved airports. I spent a lot of time in them as my Dad worked near Heathrow for most of my childhood and my family would always too and from Mauritius so I was super happy to finally work in a place that is full of nostalgic childhood memories. I love my job however, as with all customer facing roles you will have your bad days with nasty people and then you'll have your good days with really nice customers who make your job and all that stress worthwhile. I am having a blast and I'm so happy that I can finally go out with friends a lot more and just go out and enjoy myself a lot more. In previous years I've spent too much of my time just stuck in my house with my family who constantly shout at me and put me down and don't really give me enough freedom. As much as I love and appreciate how much they care and are concerned about my safety it can get quite frustrating and suffocating. I don't really tend to speak about my family on social media as I don't like to discuss private relationships but me and my family don't really tend to get along all that well the majority of the time. My parents can be quite controlling when it comes to my life choices and I constantly get put down about my weight and stuff which does leave me feeling upset and angry and I've spent a lot of nights this year crying to the next day being happy again. It's very odd. I've watched a lot of friends move on in their relationships this year. I've seen friends get engaged, to getting married to even having their own kids and moving in together. I'm not going to lie here and will say that I have gotten quite jealous at times which I'm well aware is an unattractive trait but I'm just seeing people move on so quickly in their lives where I'm still at home trying to figure out where to go next. I'm happy for them of course and look on proudly at how incredibly happy they all are. I guess it scares me because I'm yet to have my first proper relationship. I turn 25 years old in 2016 but at the same time I definitely need to gain some independence from my parents first of all. I hope in 2016 I can gain this and hopefully get my own place. I definitely want to start living my life first and then I'll see about relationships afterwards. On the topic of friendship 2015 was a year where I rekindled old friendships and made a lot of new friends. I also learned who my true friends are and who I just need to leave behind. I'm lucky in the sense I've always had friends close by who I can just call up and talk to, however this year has made me realise who actually cares when I do that and who doesn't. This year I've realised I tend to make the effort a lot and not so much other friends and I don't believe that's how friendships work. As you get older you realise it's not the quantity of friends that matter but the quality and I have certainly learned that this year. I have made a lot of new friends as well this year and had so many memories with new people which I do consider some of my closest friends now so I am very lucky in that sense. I don't agree with the theory that you can't be close friends if you've known them for such and such a period of time because some of the friends I've known for around a year now I'm closer too than the friends I've known for 12. Makes me realise that this saying is completely true. 'It's not about who you've known the longest, it's about who came and never left'. I've definitely lived by this saying this year as it's extremely true. I'm excited for the year ahead. 2016 could be one of the best years of my life now that I have a job and the ability to do more with my life. I won't go on too much here as I have a whole new post coming up tomorrow about New Years Resolutions and my plans for 2016 but I'm super excited. I'll end this post here by saying a massive thank you to all of you who have supported my blog in 2015. I have a lot of plans for my blog over the next year with brand new content. I am so excited and looking forward to seeing how I manage my blog along with my full time job. I hope you enjoyed this post and I wish you all a very Happy New Year. I've included the above collage which serves as some memories I've made with various friends and other people this year. 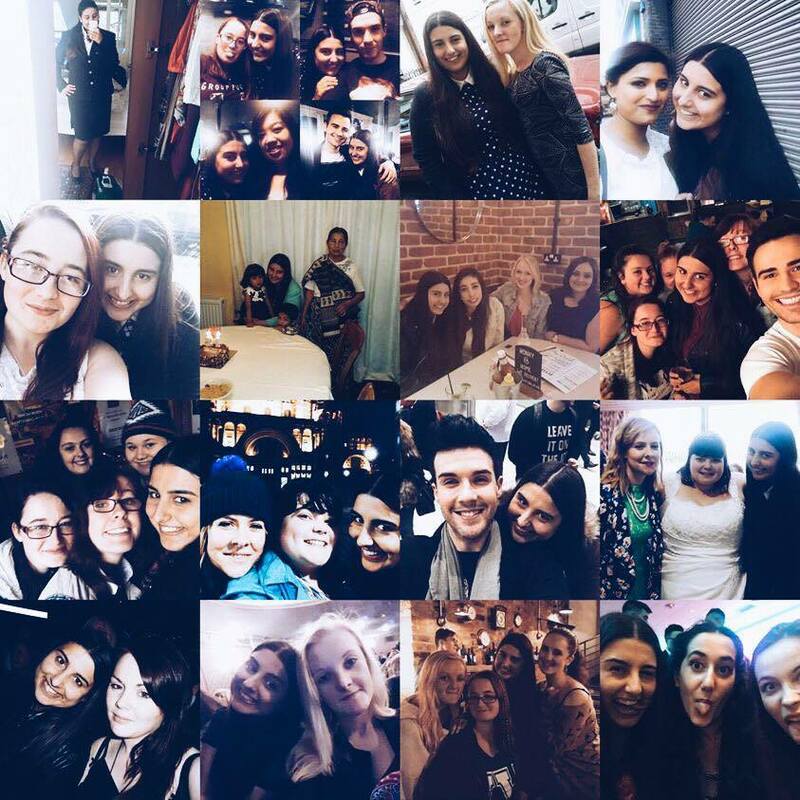 Everyone in these photos has a special place in my heart and I can't wait to see where 2016 leads us all. Whatever you're doing tonight or however you're seeing in the New Year I hope you all have a fantastic time. Celebrate but also stay safe!! I'll be back tomorrow for my first post of the year where I'll introduce you to all my goals of the year so be sure to stay tuned for that. Happy New Year once again.